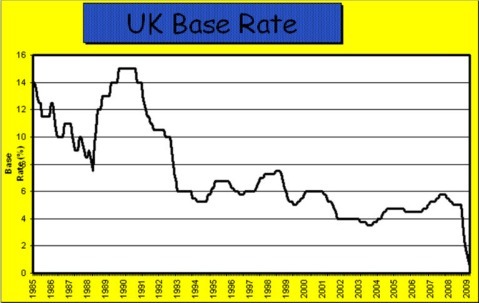 and you can change the graph to show mortgate rates. All in a spreadsheet to satisfy all your desires... lol. Cool, thanks for that. So based on that graph we can expect Mortgage rates to return to at least 5.5% (standard variable rate) and could go as high as 8.5%. Does anyone think this is realistic? If it returned to 8.5%, a £270,000 25 year mortgage currently at 4% and a montly repayment of £1,400 would jump to £2,100 per month! Even a return to 7% would work out at £1,930 per month. That is going to hurt a lot of recent buyers real bad.